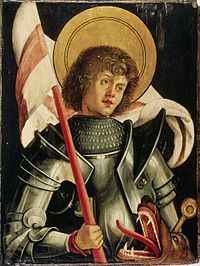 Saint George (Greek: Γεώργιος, Geṓrgios; Latin: Georgius; d. 23 April 303) was a soldier of Cappadocian Greek origins, member of the Praetorian Guard for Roman emperor Diocletian who was sentenced to death for refusing to recant his Christian faith. He became one of the most venerated saints and megalo-martyrs in Christianity, and he was especially venerated as a military saint since the Crusades. 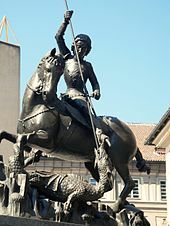 England, Ethiopia, Georgia, the Spanish region of Catalonia and several other nation states, cities, universities, professions and organisations all claim Saint George as their patron. The earliest text which preserves fragments of George's narrative is in a Greek hagiography which is identified by Hippolyte Delehaye of the scholarly Bollandists to be a palimpsest of the 5th century. An earlier work by Eusebius, Church history, written in the 4th century, contributed to the legend but did not name George or provide significant detail. The work of the Bollandists Daniel Papebroch, Jean Bolland, and Godfrey Henschen in the 17th century was one of the first pieces of scholarly research to establish the saint's historicity via their publications in Bibliotheca Hagiographica Graeca. 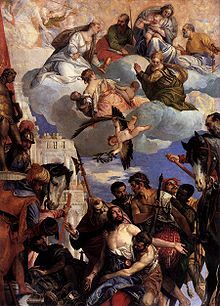 Pope Gelasius I stated that George was among those saints "whose names are justly reverenced among men, but whose actions are known only to God." The most complete version of the fifth century Greek text survives in a translation into Syriac from about 600. From text fragments preserved in the British Library a translation into English was published in 1925. In the Greek tradition, George was born to Greek Christian parents, in Cappadocia. His father died for the faith when George was fourteen, and his mother returned with George to her homeland of Syria Palaestina. A few years later, George's mother died. George travelled to the capital Nicomedia and joined the Roman army. George was persecuted by one Dadianus. In later versions of the Greek legend, this name is rationalized to Diocletian, and George's martyrdom is placed in the Diocletian persecution of AD 303. The setting in Nicomedia is also secondary, and inconsistent with the earliest cultus of the saint being located in Diospolis. 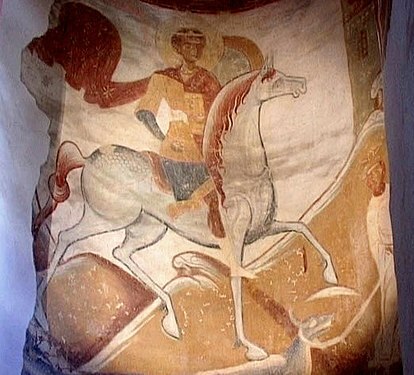 The legend of Saint George and the Dragon was first recorded in the 11th century, in a Georgian source. It reached Europe in the 12th century. In the Golden Legend, by 13th-century Archbishop of Genoa Jacobus da Varagine, George's death was at the hands of Dacian, and about the year 287. The tradition tells that a fierce dragon was causing panic at the city of Silene, Libya, at the time Saint George arrived there. In order to prevent the dragon from devastating people from the city, they gave two sheep each day to the dragon, but when the sheep were not enough they were forced to sacrifice humans instead of the two sheep. The human to be sacrificed was elected by the city's own people and that time the king's daughter was chosen to be sacrificed but no one was willing to take her place. 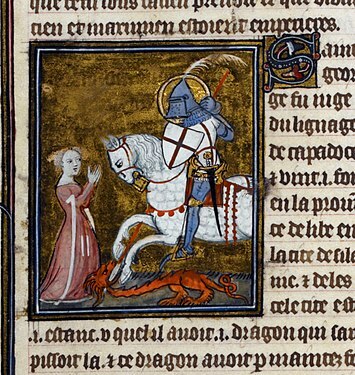 Saint George saved the girl by slaying the dragon with a lance. The king was so grateful that he offered him treasures as a reward for saving his daughter's life, but Saint George refused it and instead he gave these to the poor. The people of the city were so amazed at what they had witnessed that they became Christians and were all baptized. The Golden Legend offered a historicised narration of George's encounter with a dragon. This account was very influential and it remains the most familiar version in English owing to William Caxton's 15th-century translation. 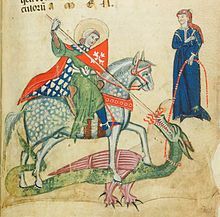 In the mediaeval romances, the lance with which Saint George slew the dragon was called Ascalon, after the Levantine city of Ashkelon, today in Israel. The name Ascalon was used by Winston Churchill for his personal aircraft during World War II, according to records at Bletchley Park. 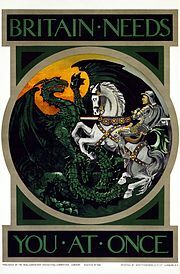 In Sweden, the princess rescued by Saint George is held to represent the kingdom of Sweden, while the dragon represents an invading army. Several sculptures of Saint George battling the dragon can be found in Stockholm, the earliest inside Storkyrkan ("The Great Church") in the Old Town. Iconography of the horseman with spear overcoming evil was widespread throughout the Christian period. The veneration of George spread from Syria Palaestina through Lebanon to the rest of the Byzantine Empire—though the martyr is not mentioned in the Syriac Breviarium—and the region east of the Black Sea. 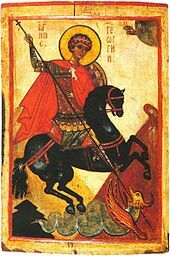 By the 5th century, the veneration of Saint George had reached the Christian Western Roman Empire, as well: in 494, George was canonized as a saint by Pope Gelasius I, among those "whose names are justly reverenced among men, but whose acts are known only to [God]." 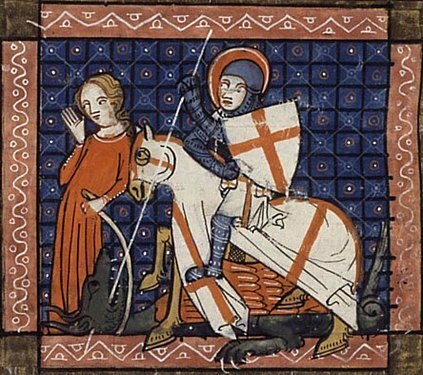 Belief in an apparition of St. George heartened the Franks at the Battle of Antioch in 1098, which made a similar appearance the following year at Jerusalem. The chivalric military Order of Sant Jordi d'Alfama was established by king Peter the Catholic from the Crown of Aragon in 1201, Republic of Genoa, Kingdom of Hungary (1326), and by Frederick III, Holy Roman Emperor. Edward III of England put his Order of the Garter under the banner of St. George, probably in 1348. 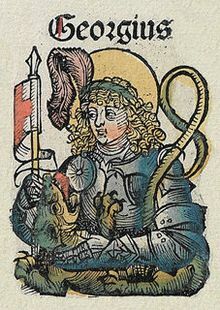 The chronicler Jean Froissart observed the English invoking Saint George as a battle cry on several occasions during the Hundred Years' War. In his rise as a national saint, George was aided by the very fact that the saint had no legendary connection with England, and no specifically localized shrine, as that of Thomas Becket at Canterbury: "Consequently, numerous shrines were established during the late fifteenth century," Muriel C. McClendon has written, "and his did not become closely identified with a particular occupation or with the cure of a specific malady." William Dalrymple, who reviewed the literature in 1999, tells us that J. E. Hanauer in his 1907 book Folklore of the Holy Land: Muslim, Christian and Jewish "mentioned a shrine in the village of Beit Jala, beside Bethlehem, which at the time was frequented by Christians who regarded it as the birthplace of St. George and some Jews who regarded it as the burial place of the Prophet Elias. According to Hanauer, in his day the monastery was "a sort of madhouse. Deranged persons of all the three faiths are taken thither and chained in the court of the chapel, where they are kept for forty days on bread and water, the Eastern Orthodox priest at the head of the establishment now and then reading the Gospel over them, or administering a whipping as the case demands.' In the 1920s, according to Taufiq Canaan's Mohammedan Saints and Sanctuaries in Palestine, nothing seemed to have changed, and all three communities were still visiting the shrine and praying together." Dalrymple himself visited the place in 1995. "I asked around in the Christian Quarter in Jerusalem, and discovered that the place was very much alive. With all the greatest shrines in the Christian world to choose from, it seemed that when the local Arab Christians had a problem—an illness, or something more complicated—they preferred to seek the intercession of Saint George in his grubby little shrine at Beit Jala rather than praying at the Church of the Holy Sepulchre in Jerusalem or the Church of the Nativity in Bethlehem." He asked the priest at the shrine "Do you get many Muslims coming here?" The priest replied, "We get hundreds! Almost as many as the Christian pilgrims. Often, when I come in here, I find Muslims all over the floor, in the aisles, up and down." 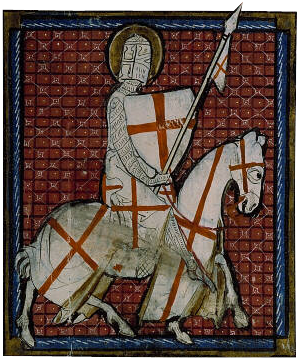 Saint George is described as a prophetic figure in Islamic sources. George is venerated by some Christians and Muslims because of his composite personality combining several Biblical, Quranic and other ancient mythical heroes. In some sources he is identified with Elijah or Mar Elis, George or Mar Jirjus and in others as al-Khidr. The last epithet meaning the "green prophet", is common to both Christian and Muslim folk piety. Samuel Curtiss who visited an artificial cave dedicated to him where he is identified with Elijah, reports that childless Muslim women used to visit the shrine to pray for children. 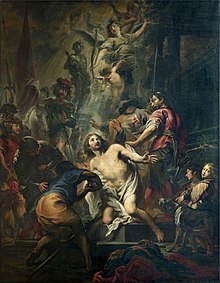 Per tradition, he was brought to his place of martyrdom in chains, thus priests of Church of St. George chain the sick especially the mentally ill to a chain for overnight or longer for healing. This is sought after by both Muslims and Christians. George or Hazrat Jurjays was the patron saint of Mosul. Along with Theodosius, he was revered by both Christian and Muslim communities of Jazira and Anatolia. The wall paintings of Kırk Dam Altı Kilise at Belisırma dedicated to him are dated between 1282–1304. These painting depicts him as a mounted knight appearing between donors including a Georgian lady called Thamar and her husband, the Emir and Consul Basil, while the Seljuk Sultan Mesud II and Byzantine Emperor Androncius II are also named in the inscriptions. In India, the Syro-Malabar Catholic Church, one of the oriental catholic churches (Eastern Catholic Churches) and Malankara orthodox church venerate Saint George. The main pilgrim centers of the saint in India are at Edathua in Alappuzha district and Edappally  in Ernakulam district of the southern state of Kerala. The saint is commemorated each year from 27 April to 14 May at Edathua  On 27 April after the flag hoisting ceremony by the parish priest, the statue of the saint is taken from one of the altars and placed at the extension of the church to be venerated by the devotees till 14 May. The main feast day is 7 May, when the statue of the saint along with other saints is taken in procession around the church. Intercession to Saint George of Edathua is believed to be efficacious in repelling snakes and in curing mental ailments.The sacred relics of St. George were brought to Antioch from Mardeen in 900 and were taken to Kerala, India from Antioch in 1912 by Mar Dionysius of Vattasseril and kept in the Orthodox seminary at Kundara, Kerala. H.H Mathews II Catholicos had given the relics to St. George churches at Puthupally, Kottayam District and Chandanappally, Pathanamthitta district. ^ Cross, Frank; Livingstone, Elizabeth, eds. (1957). The Oxford Dictionary of the Christian Church (2005 ed.). pp. 667–668. ^ Brooks, Ernest W. (1925). "Acts of S. George". Le Muséon. 38: 67–115. ISSN 0771-6494. ^ Collins, Michael (2012). "3 The Greek and Latin traditions". 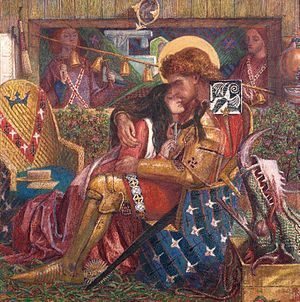 St George and the dragons : the making of English identity. Fonthill. ISBN 978-1781556498. ^ Guiley, Rosemary (2001). The Encyclopedia of Saints. p. 129. ISBN 978-1438130262. George was an historical figure. According to an account by Metaphrastes, he was born in Cappadocia (in modern Turkey) to a noble Christian family; his mother was Palestinian. ^ Pirlo, Paolo O. (1997). "St. George". My first book of saints. Sons of Holy Mary Immaculate – Quality Catholic Publications. pp. 83–85. ISBN 971-91595-4-5. ^ Hanauer, JE (1907). "Folk-lore of the Holy Land, Moslem, Christian and Jewish". Retrieved 18 January 2007. ^ Elizabeth Anne Finn (1866). Home in the Holyland. London: James Nisbet and Co. pp. 46–47. ^ B, Sathish (20 March 2008). "St. George forane church Edathua-689573". Edathuapalli. Sathish B. Retrieved 5 February 2017. ^ "St. George forane church Edappally". Edappally. St: George Church. 22 April 2014. Retrieved 5 February 2017. ^ Morgan, Giles (2017). 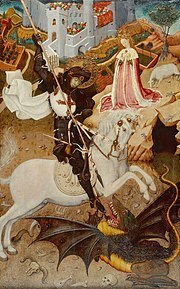 St George: The patron saint of England. Oldcastle Books. ISBN 978-1843449676. ^ Fargher, Brian L. (1996). The Origins of the New Churches Movement in Southern Ethiopia: 1927–1944. Brill. ISBN 978-9004106611. ^ "Vatican stamps". Vaticanstate.va. Archived from the original on 1 October 2011. Retrieved 23 April 2011. Natsheh, Yusuf. 2000. "Architectural survey", in Ottoman Jerusalem: The Living City 1517–1917. Edited by Sylvia Auld and Robert Hillenbrand (London: Altajir World of Islam Trust) pp. 893–899.